An accident can create various situations, more or less serious, in which people may find themselves in danger. How things turn out for them depends on what happens in the interval of time between the accident itself and the treatment they receive. In order to use this time as best as we can we need to be able to know the proper techniques and procedures and put them into practice immediately. The right choice at the right time will in fact protect and save the injured person or persons, by helping to prevent any further complications, all of which will be also of obvious benefit to Public Health as a whole. This is the reason why it is of fundamental importance that First Aid should be given not only by highly qualified persons, and not necessarily present at the moment of the accident, but anyone who has a thorough knowledge of what to do in these situations. 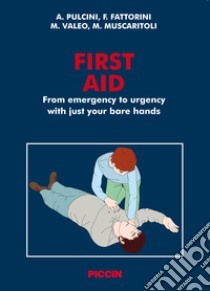 For this reason I am pleased to present this rapid and complete guide, which will give an overall view of the needs of an injured person, whether in a critical situation or not, focusing the attention on the importance of how to use the time at our disposal in giving First Aid. In order to offer an easy way of remembering the order of interventions, we have used the mnemonic P.A.C.E.S. throughout the book. The book comes from the teaching experience of the authors (Prof. Pulcini was also my pupil), who have used their individual specialities to give a coordinated picture of the possible solutions that the various situations represented require.The book examines many situations requiring First Aid, from the more simple and common to the most complicated ones. The descriptions of the various techniques are very effective as demonstrations, thanks to the clarity with which they are described, and so especially useful to anyone having to perform First Aid on a person who has been injured or who for various reasons is in a life-threatening situation. As we are dealing with unexpected and unforeseen situations, all the techniques presented have been conceived as being used without any other means or instruments, but just with the use of our own hands. I am certain of the success of this book because it is a useful book, not only for students who have to sit the exam of the degree course in Medicine and Dentistry, but for all those who for whatever reason, “with their own hands”, may find themselves having to deal with an injured person in a dangerous situation.